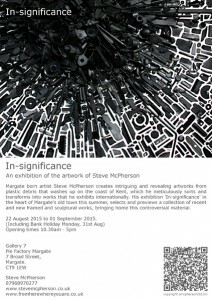 My solo exhibition ‘In-significance’, Margate, Aug 2015. 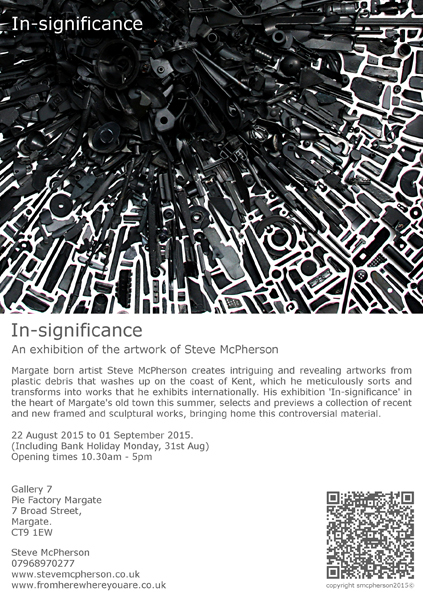 Margate born artist Steve McPherson creates intriguing and revealing artworks out of plastic debris that washes up on the coast of Kent, which he meticulously sorts and transforms into artworks that he exhibits internationally. His exhibition ‘In-significance’, in the heart of Margate’s old town this summer, selects and previews a collection of recent and new framed and sculptural works bringing home this controversial material.